After a lucky streak in the late Summer where I seemed to be winning every couple of weeks, either outright or with a low cancel machi number, I got back into a bit of a drought. It wasn’t that I wasn’t getting anything via the ticket center, but the cancel machi numbers I was receiving were all relatively high, and for Team A, which is a bit tougher to win. After getting my Cancel Machi email on Sunday for the new Kenkyuusei stage, I was a bit more hopeful. I really wanted to win this too since both Zunchan and Ranchan would be appearing. This would be my 48th(!!!) theater show. I’m not sure how many times I have seen 16th gen and the 3rd gen draftees, but it must be creeping up to the same number of times I saw SDN48 back in the day. Of course this would be the first time seeing the kenkyuusei do Pajama Drive, although I have seen Team B’s third stage before. In fact, I saw its original run back in 2008. Ahh, the memories! I am pretty sure I saw 15th gen do it as well. The stage is a lot of fun, and is generally considered one of the most beloved stages of all time. I got my Homma Mai seitensei package from the committee, and upon entering the theater I made my usual beeline to the far right side of the room. It’s an obstructed view, as the right pillar pretty much blocks most of the center stage, but there are fewer people over there, and you have a clear shot of the right side of the stage. Luckily I found a spot with nothing but short people in front of me, so it worked out perfectly. 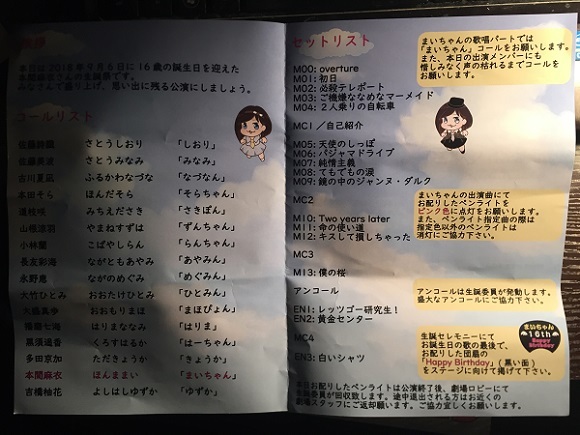 Obviously I was interested in where my favorite members would be placed in the units, and to my surprise both Ranchan and Zunchan were centers for their respective songs; Ranchan centering Pajama Drive and Zunchan centering Jean da Arc. Hitomin, another member I really like, centered Junjou Shugi.Sorachan was also in the Jean da Arc unit, so all the members I really like seemed to get nice unit positions. Not to mention, both Zunchan and Ranchan seemed to get plenty of front and center time throughout the stage. As for other members I noticed. I was glad to see Sato Shiori back in the lineup since I hadn’t seen her in a while. She is totally goofy, and a lot of fun on stage.Sato Minami’s popularity seems to have skyrocketed after Produce48. She was getting some intense cheers throughout the show. I have noticed Omori Maho’s lane at handshake events getting bigger lately, but never really noticed her until this show. She is quite cute, and makes very cute expressions on stage. And since they were on my side a lot, I saw a lot of Kyoka, Ayamin, and Sakipon. As for the two new girls, neither stood out to me much, but it was their first time after all. 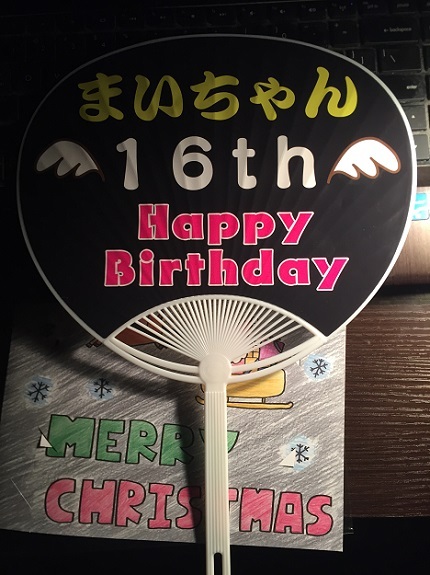 We received a booklet, uchiwa, and a rental penlight to use during the show. Before the encore call, the fan leading it went on for quite a long time with his tribute to Maichan. That said, there was no cake, no streamers, and no Namida Surprise? Did they stop doing that entirely? Or did Homma just get gypped? I dunno, it just seemed like they kinda rushed through the birthday. According to the feedback I received, this is standard operating procedure for Kenkyuusei. 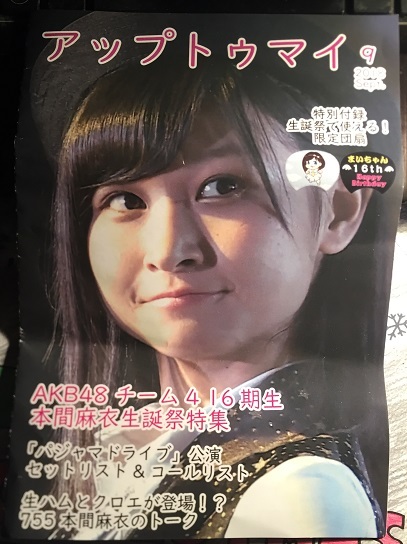 But I remember a lot more fanfare when I went to Zunchan’s seitensei. I also didn’t notice any flowers, but given the circumstances of my entrance and exit from the theater, I may have just missed them. As the girls lined up for the exit procession Zunchan was directly in front of me, and seemed to be scanning the crowd for fans she knew. I kept waving to her, but every time I did I would instead catch the attention of Ayamin who would wave back at me, LOL. Although this ended up serving me well since when it was my turn I got a big ‘English’ greeting from Ayamin. Not to be outdone, Zunchan not only gave me a big ‘surprised’ reaction, she also had time to exclaim “You got a haircut?? ?” She saw me on Friday at the handshake event, and I got it cut on Sunday, so yes. That’s pretty cool that she noticed, eh? I knew I would get an extra special reaction from Sorachan as well since I also had a handshake with her on Friday. Hitomin and Shiori were also highlights. Of course I made a big deal out of Ranchan when I saw her, and we always connect really well. Maichan thanked me in English as I congratulated her before exiting the theater, but not before picking up the commemorative show photo booklet. So my 48th show is in the books. My next ‘milestone’ show would be #50, which hopefully I get before the end of the year. Ultimately I thought the trainees did an excellent job on this stage. Frankly, I think they are just as entertaining in the theater as any of the established teams. Not to mention that most of the girls I like are kenkyuusei, so I am happy win their shows almost exclusively. That said, I will be applying for the 13th anniversary stage, although it is going to be extremely hard to win.